Taste wine for 75 cents, drink a glass for $3.75, and forget about $10 tasting rooms. Avant, the wine and tapas bar in the new Terravant facility in Buellton, is priced to encourage patrons to have fun and experiment with the more than 120 wines made onsite. Every part of the Terravant custom crush winemaking facility is modern, stylish, and technologically advanced. From making irrigation water out of the CO2 and alcohol that comes from the fermentation process to water heated by the air-conditioning process in barrel rooms, the infrastructure is designed to be easy on the environment. 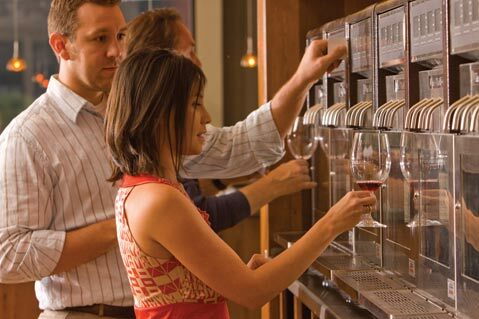 Avant is equally high-tech with a wall of “tasting stations” that pour a taste, half-glass, or full glass of wine when you insert a pre-paid card and push a button. The tasting stations have whites, roses, and serious reds, even port. Descriptions of each wine are set out to help tasters remember what they like, which is important when there are 40-60 different wine bottles open at all times. The large oblong bar with a view of the Santa Ynez River is a more social option for wine tasting. The winemakers themselves will often be pouring and talking about their wines. While tasting prices vary by the price of the bottle, four tastes from four $20 bottles of wine will probably cost around $3. The average tasting price is $1 for one taste. The technology behind the stations makes it possible to try wines for such a low price-in the machine, inert gas replaces the wine dispensed so that no air reaches the wine left in the bottle, thereby preserving it. Across the room from the wine tasting bar, patrons can view the industrial side of Terravant: an enormous room filled with five-ton fermentation tanks. Stepping through the door onto the metal balcony overlooking the tanks stacked from floor to high ceiling, guests can smell the wine as it is made. With so many wines to try, food may be required to soak up excess alcohol. “Tapas” originated in Spain as small items placed on top of wine glasses to keep the flies out. Then, chefs placed a few nuts, pieces of cheese, or olives on top to complement the wine. Avant does this on a more gourmet scale. The menu, designed by Creative Chef Jeff Olsson, is seasonal and simple, allowing each ingredient to be savored: Perfectly roasted almonds, Picholine olives, and flakes of crunchy aged parmesan is one option. For the next few weeks, look for dishes like heirloom tomatoes with wild boar bacon, drizzled with smoked chile buttermilk vinaigrette for $7. Hot foods are cooked in a wood-burning oven, like pizzas for $6, or baked Anaheim chiles in queso tetilla on crostini for $5. The walls of the wine and tapas room are decorated with large prints of 18th-century woodcuts depicting the winemaking process, which hasn’t changed much throughout the centuries. Even at Terravant, winemakers can choose to make their wines the way they did 300 years ago with manual presses. Bob Kelly, owner of Pacific Ridge Vineyards, was one of the first to sign up with Terravant. He explained, “The many options for every phase of wine production really do make it seem like you’re a kid in a candy store. It is great for small wineries to have the opportunity to take advantage of state-of-the-art equipment worth millions of dollars and to have lab staff onsite, closely communicating with the winemakers.” That equipment includes a $500,000 lab and an on-staff oenologist, Darren Michaels, who can manipulate alcohol and acidity levels even in finished wines to produce the best possible taste. There are more than 2,000 combinations of oak barrels available alone, with variations such as the forest in which the oak was grown and the specific cooper who made the barrel. It’s not just the technology or customization that draws winemakers to Terravant. Kelly appreciates the “sense of pulling together to help everyone succeed” at the facility. Most of Terravant’s winemakers are small producers who rarely sell in retail stores because there are not enough bottles to go around. But at Terravant, small producers and emerging winemakers can sell and make their wines next to established names like Summerland, Ken Brown, and the Hitching Post, who also operate out of Terravant. Terravant is located at 70 Industrial Way in Buellton and is open Thursday through Sunday, from 11 a.m-8 p.m. Call 686-9400 or see terravant.com.